Hi there! 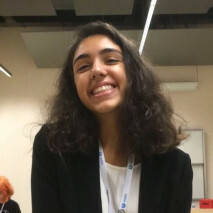 I’m Miray, a seventeen-year-old with such a passion for MUN. Since I’ve become a senior this year, I’m no longer available to be an active MUNer -sadly-. However, it doesn’t mean that I have to cut MUN off my life as a whole. While adding my endless appreciation for the MUNTurkey team for providing me such an amazing platform, I would like to state my excitement to be able to talk about MUN without the fear of boring someone, hopefully at least 😉 If you are ready for this journey as well, then let’s make this season a great one!